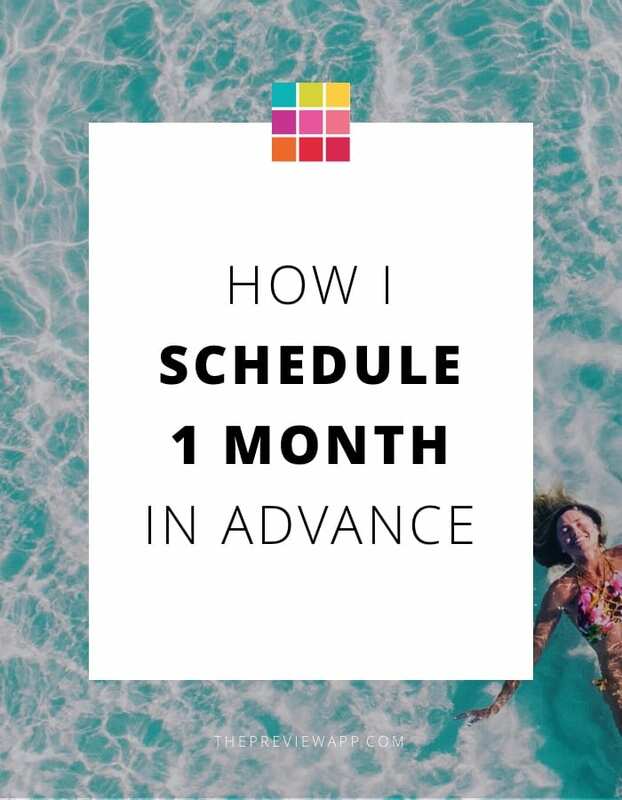 I’m going to tell you exactly my routine when I schedule my Instagram feed one month in advance. It’s super easy. I don’t ever stress about what I have to post next anymore. These tips are especially good for you if you have a business or you are a blogger, and you are looking for an efficient system. Of course, I use Preview App to schedule my feed. I love it because I can schedule unlimited photos, videos and carousels – for free. I do all my editing in the app too. 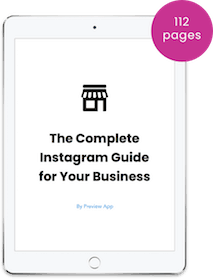 Warning: For those of you who are very serious about growing your Instagram, I’m going to give you lots of quick tips along the way to streamline your scheduling process as much as possible. Decide what to post. Pick 3 or 5 things you are passionate about. What should you account be known for? If you want to post photos of everything and anything, that’s fine. This step doesn’t apply to you. Just add all the photos you have in your Preview App. I know exactly what I have to post so I don’t have to scout the Internet in search for ideas. No more stress. I’m focused. I know what my content is going to be. Of course, I can posts about other things here and there. But I know what my core content is, and my dear followers will also know what to expect from me (and what they are pressing that “Follow” button for). How do I find so many things to post for a month? I have an idea bank. My idea bank is where I write all my ideas, quotes and tips. I write them in Trello and a Word Document. Every beginning of the month I open my idea bank and I decide which ones to share. Ah! 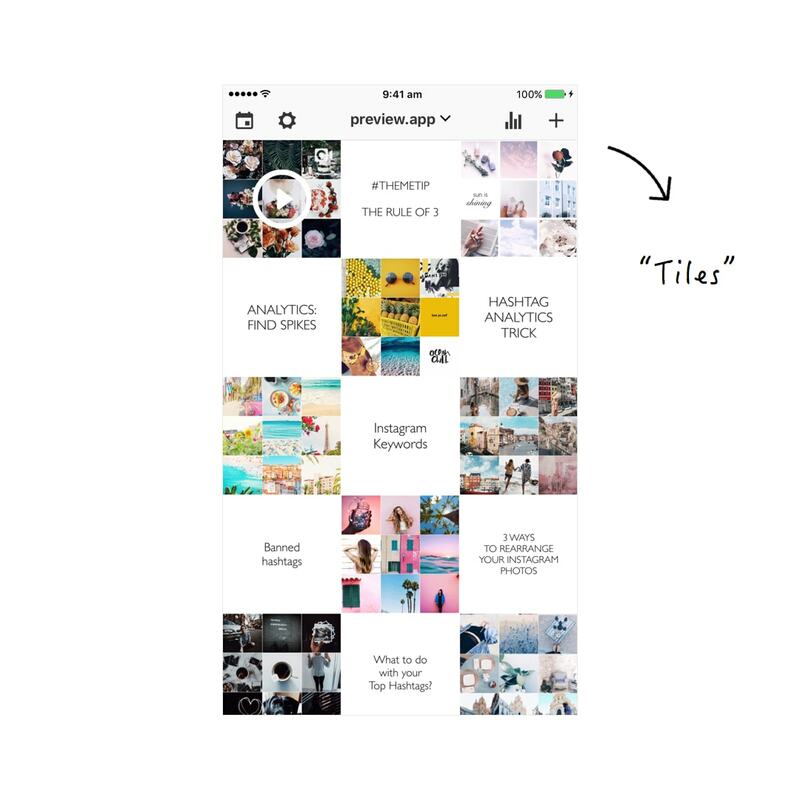 This is my favorite part: choosing an Instagram grid layout. A layout will help you stick with a specific look for your feed. It will make your feed look organized, effortlessly. There are 9 types of layouts you can choose from – I’ve written all about them here. I stick with the tiles layout. It means I post one tip, then one theme, then another tip, and again another theme. And strategies to grow your account. The next thing I do is choosing how many times a day I want to post. If I know how many times a day I post, I know how many posts I need to schedule for the month. 1 post a day = 30 posts. Choose a realistic number. If you can commit to once every two days, that’s fantastic. If you can post once every day, great! If you can commit to twice a day, perfect! I choose to post once a day (or once every two days depending on the type of tips I share – sometimes I want people to take their time to read my tips). This way I know that 1 post a day = 30 posts I have to add in my Preview App. Quick tip: I schedule one week before moving on to the next. Now I know what to post and my grid layout. Time to upload all my photos and videos in Preview. I drag and drop to rearrange the order of the posts in order to achieve the tiles grid layout I chose previously. Quick tip 1: Are you going to post quotes? Make your life easier. Use templates. I don’t create my quotes / tips on my computer. I create them in Preview. 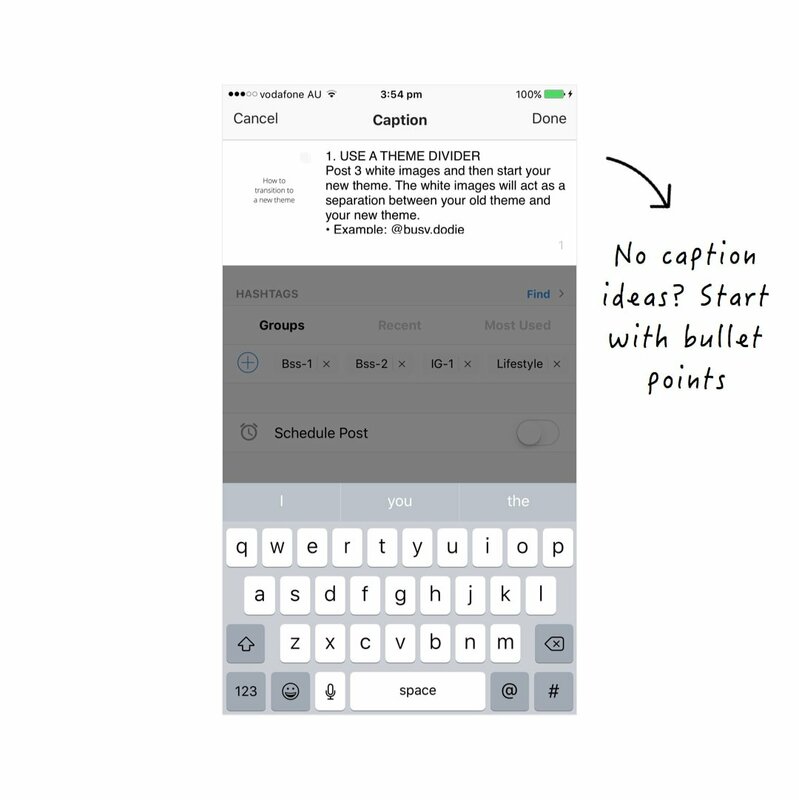 I upload white images in my Preview App and then use the text tool in the Editing Tools section to write my tips. You can use any other template (it doesn’t have to be a white image). I explained everything in this article: 3 ways to create templates for your Instagram posts. 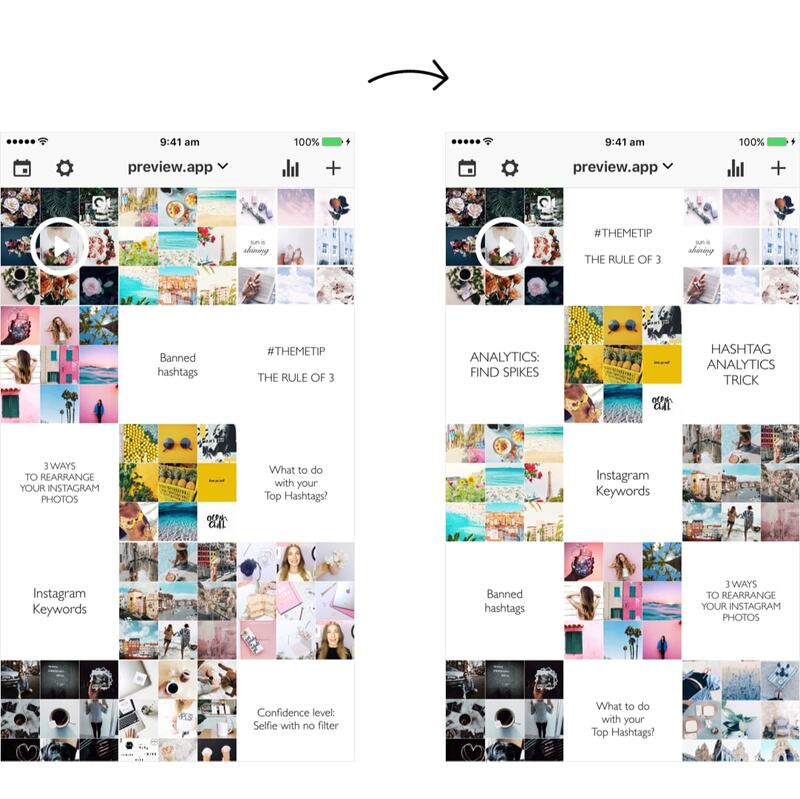 Quick tip 2: Use the “Repost” feature in your Preview App if you curate photos from all over Instagram. All my posts are in my Preview App. Perfect! Time to prepare what I’m going to write. Let’s talk hashtags first. In my opinion, hashtags are one of the most powerful tools on Instagram – because that’s how people find your account. I’ve saved all my hashtag groups in my Preview App. No more text replacement or copy and paste from my Notes app. I just tap on the hashtag group I want to add it to the caption. Preview also comes with a Hashtag Finder. So I don’t even have to do my hashtag research anymore. 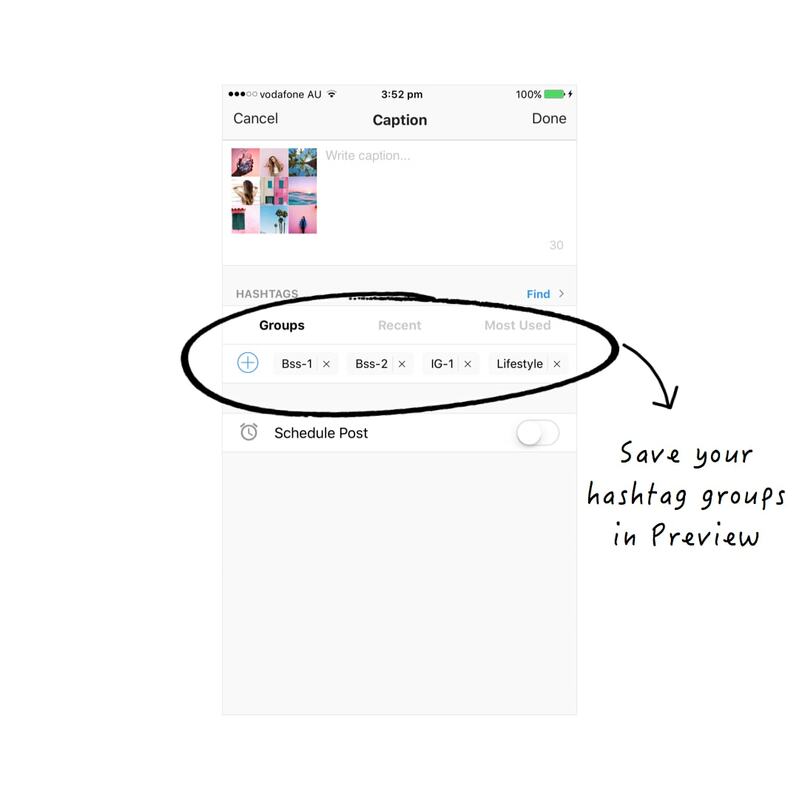 Quick tip: Preview App also tests your hashtag groups automatically. It tells you which hashtag group gets you the most likes, comments and engagement. So if one hashtag group doesn’t lead me anywhere (it doesn’t give me much likes, comments or engagement), I delete it and create another one. Let’s be real: it’s hard to write a caption on the fly. I usually use dot points to write my ideas and tips. This way I already have the backbone of my caption ready to go! I just have to add little bits and pieces. I also add my hashtag group by just pressing on the one I want to use. Almost done! My posts are all in my Preview App. I have rearranged them into a layout. My captions and hashtags are ready. I just need to schedule them. But before I do so, I want to see when my best time to post is (so the majority of people can actually see my posts). Quick tip: I strongly recommend you test your best time to post. The time at which you’ve posted before might not be the best one for you (or it might!). 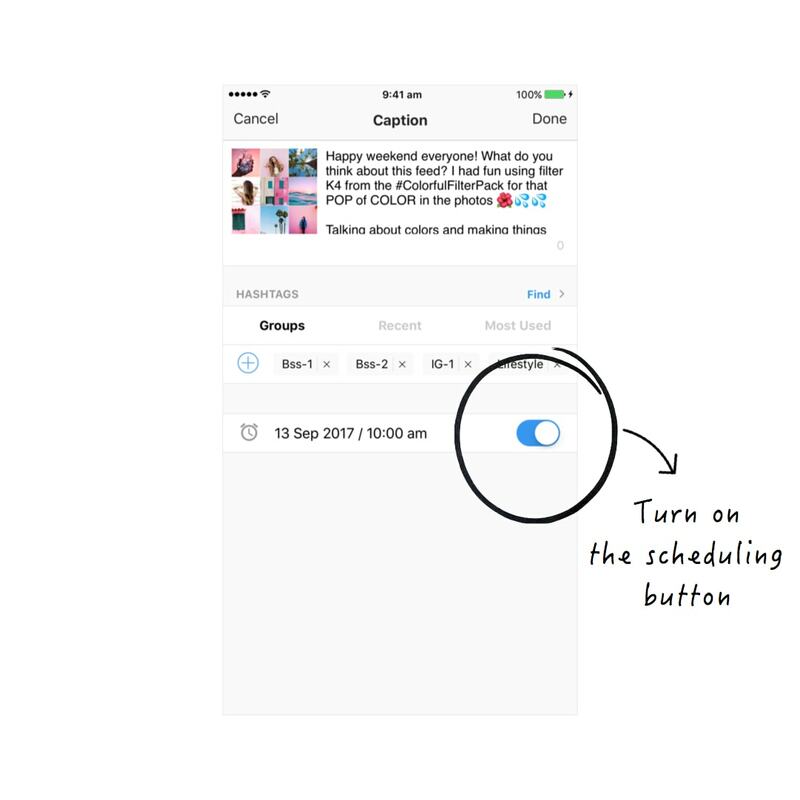 Have a look: Why posting at different times on Instagram is important. Now that I know my best times, I schedule my posts at 2 or 3 different times (so I can reach different people from different time zones). Your turn to schedule your feed! You read until the end! Tell me in the comments: Was this article useful? Feel free to let me know if you have any other questions. If you’re wondering where to start: start with your idea bank (a folder with all your ideas, photos, quotes). 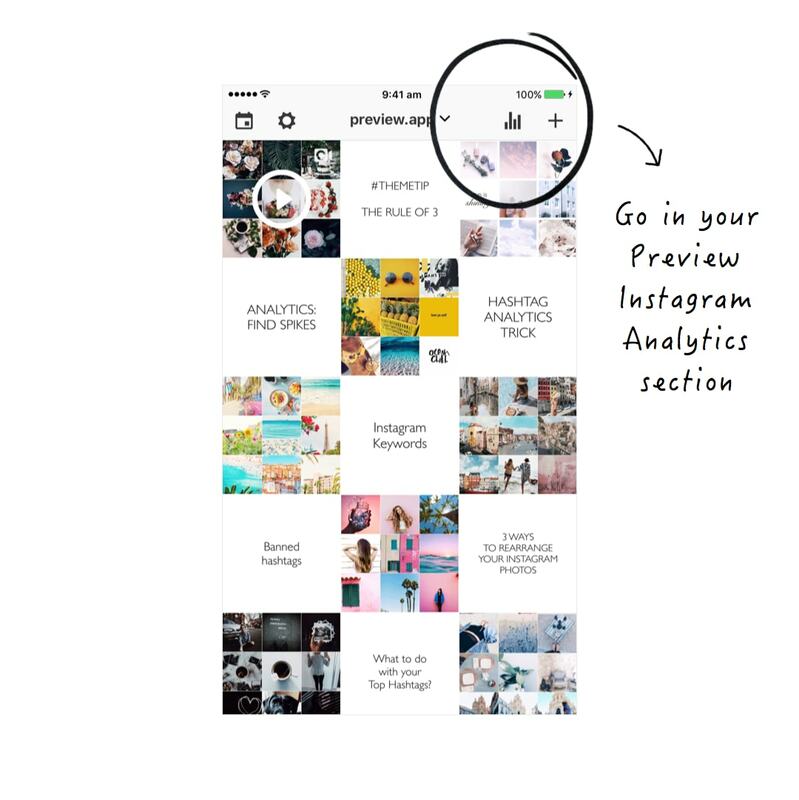 Until next time, see you all on Instagram (@preview.app) for more tips, tricks and theme ideas!